There are many interesting tourist places near Bangalore, whether you're after an escape from city life or are a visitor who wants to spend a day enjoying the abundant beauty of Mother Nature. These tourist attractions are listed in order of their distance from the city. Dodda Alada Mara is a big banyan tree, located 28 kilometers (17 miles) from Bangalore at Ramohalli. This gigantic tree is assumed to be 400 years old, sprawling over 3 acres of land. However, it now looks like a number of separate trees after its main root succumbed to natural disease. Wonder La, the amusement park, is located 40 kilometers (25 miles) from Bangalore, on Mysore Road. Incorporating the latest technologies, the park offers several excitements to visitors. Its features also include dry rides and wet rides. This can be an ideal place for spending weekends not only for the kids but for all age groups. A resort opened there recently. This famous picnic spot, 40 kilometers (25 miles) from Bangalore in Anekal, has an enchanting waterfall and a small temple. It's also known as Pearl Valley. Muthyalu means "pearls" and maduvu means "pond" or "pool" in Kannada, the local language of Karnataka. Located 49 kilometers (30 miles) southwest of Bangalore, Ramanagaram is a great place for adventure seekers and rock climbers. Another attraction in Ramanagaram is the silk industry. The town has the largest silk cocoon market in Asia. Apparently, 50 tonnes of silk cocoons arrive there per day, to be made into silk.thread for weaving. Shivaganga, located 56 kilometers (35 miles) from Bangalore is an interesting hill with four faces and a height of 4,600 feet. It's also known as Dakshin Kashi. The hill looks like a Nandi from the east, Ganesh from the west, a linga from the south, and cobra with its hood spread from the north side. The hill has two famous shrines, dedicated to Lord Gangadeshwara and Goddess Honnadevi, and a freshwater spring called Pathala Ganga. Situated 60 kilometers (37 miles) from Bangalore, this place is famous for the Savandurga Hill and the temple. Savandurga is formed by two hills known locally as Karigudda (black hill) and Biligudda (white hill). It's believed to be one of the largest monolith hills in the world. 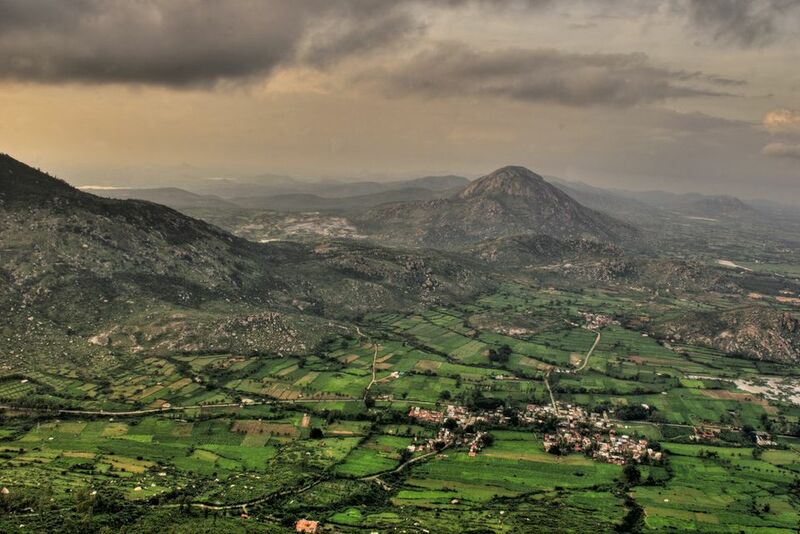 Nandi Hills, 60 kilometers (37 miles) from Bangalore, is an evocative hill fortress. It was one of the popular retreats of Tipu Sultan, known as the Tiger of Mysore. Tipu's Drop, a 600-meter high cliff face, provides a magnificent panoramic view of the beautiful terrain. Nandi Hills is a highly popular getaway destination of Bangaloreans to beat the heat of the sun during the summer. Those who reach the top of the hill by climbing the 1,175 steps are rewarded with a splendid view of the city. Also visit ancient Bhoga Nandeeshwara Temple, with architecture to marvel over, in the village at the foothills. Devarayadurga, 65 kilometers (40 miles) from Bangalore, is a hill station in Tumkur. It's a good place for trekking and rock climbing. Apart from Lakshmi Narasimha Swamy Temple built in Dravidian style, Namadha chilume -- a natural spring coming of the surface of the rock -- is also there. Mekedaatu means goat's crossing in the local language. This heavenly region is located 110 kilometers (68 miles) from Bangalore, on Kanakapura Road, surrounded by the silence of mountains and the calmness of the river. It's a popular picnic spot, although it needs to be better maintained. Sangam is the confluence of the river Cauvery and Arkavathi, and the river flows through a deep gorge at the point called Mekedaatu. Note: it can be dangerous to venture into the water in certain areas due to the unexpectedly strong currents. Many people have died as a result. Shivanasamudra is a small town in Mandya District, 120 kilometers (75 miles) from Bangalore, situated on rocky terrain with traces of vegetation. It's an alluring spot, with two cascading waterfalls named Gaganachukki and Bharachukki, on River Kaveri. These falls are the source of Asia's first Hydro Electric Power project called Shimsa. Ranganathittu Bird Sanctuary is Karnataka's largest bird sanctuary, located in Srirangapatana in Mandya District, 125 kilometers (78 miles) from Bangalore. One of the best places to go birding in India, it's comprised of six islets on the banks of the Kaveri River. The islands host water birds such as Painted Stork, Common Spoonbill, Asian Openbill Stork, Woolly-necked Stork, Black-headed Ibis, Lesser Whistling Duck, White Ibis, Indian Shag, and Stork-billed Kingfisher. Other common birds like egrets, cormorants, Oriental Darter, and herons can also be found there.